Clearly, it seems to be another big event for Marvel—in an event-crazy year, as we still haven’t even gotten to the impending evil Captain America event, Secret Empire. 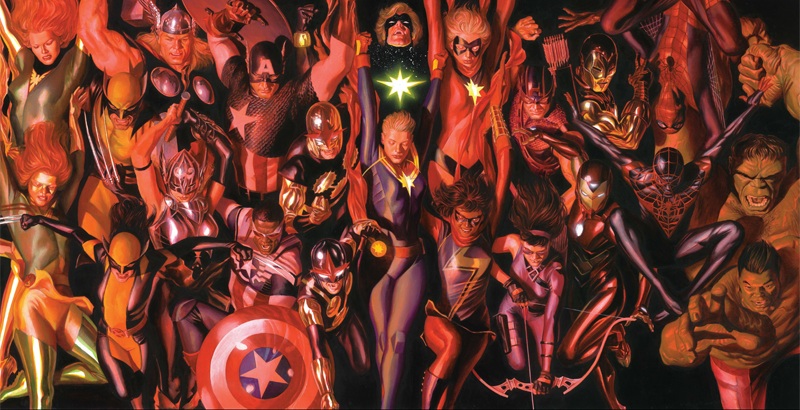 And the implication seems to be about discussing the role of legacy characters in the Marvel universe—we’re seeing the original versions of Wolverine, Jean Grey, Captains America and Marvel, Hawkeye, and more alongside their current, modern successors. Some of these heroes already work alongside each other, like Peter and Miles Morales, Kate Bishop and Clint Barton (although Kate’s off on her own thing at the moment), Steve Rogers and Sam Wilson. Some are impossible pairings—Mar-Vell, the original Jean Grey, and Bruce Banner are all dead, the Odinson is currently incapable of wielding Mjolnir as Thor, Tony is currently... whatever Tony currently is. So how are they coming together. Is it time travel? Alternate realities? Are they actually coming together, or is their presence behind their successors a more symbolic thing? Let us know what you think in the comments, because for now, it seems like we’re not going to get more information until a bit later.